Writing a book like this is a complicated task, subtracting time from leisure, family and work... but it is a stimulating challenge forcing the Author to critically review his own practice. The most difficult aspect of it is defeating the temptation to make a parade of all the "best cases". The aim of a book like this , in fact, is to be helpful to the Reader, and not to be rewarding for the Author. This is the reason why unsatisfactory results and long-term unfavourable changes are reported and described whenever possible. The outcome of our surgical effort is rarely, if ever, stable in the long run, and I have tried to show as clearly as possible the changes that usually occur. This is useful in order to prevent unfavourable changes, when possible, and to give the patients complete and correct pre-operative information. I believe that an individualized selection of the procedures is often more important than a brilliant surgical performance. The specific indications for each procedure are therefore thoroughly discussed before entering the surgical details. The surgical techniques are illustrated by intra-operative pictures in a "step-by step" fashion. I intentionally avoided the use of drawings which can make some steps clearer but are always "artificial" and cannot truly represent the surgical field. Of course, this book does not intend to review the whole spectrum of surgical techniques. It represents a single surgeon's view: although obviously incomplete, it reports a homogeneous strategy to plastic surgery of the breast. In order to have different viewpoints, I asked Madeleine Lejour and Frank Elliott to critically comment each chapter. Madeleine and Frank honoured me by their enthusiastic participation: their comments add a lot of interest to this book and make it possible for the Reader to compare different approaches to the same problem. The first fifteen chapters of this book are dedicated to breast reconstructive surgery. The final goals in post-mastectomy patients are examined in Chapter 1. Starting a book with the selection of the final goals may appear to look at the problem upside-down. Actually, the surgeon needs to know where the patient wishes to go, before choosing the way to get there. The starting point of the reconstructive journey, i.e. the individual characteristics of the post-mastectomy patient are described in Chapter 2. The knowledge of the final destination and of the starting point makes it possible to choose the route: algorithms and charts for selection of the surgical technique are illustrated in Chapter 3. Chapters 4 to 10 are dedicated to abdominal flap transfer: pre-operative planning (Chapter 4), surgical techniques (Chapter 5), complications (Chapter 6), secondary stages (Chapter 7). The use of the abdominal flap in secondary and in bilateral reconstruction is described in Chapter 8 and 9, and the evaluation of long-term results is reported in Chapter 10. In Chapters 11 to 13 reconstruction using implants is considered, from the selection of candidates, through the surgical steps, to associated procedures (Chapter 12) and complications and untoward results (Chapter 13). Chapters 14 and 75 are devoted to specific problems: reconstruction after conservative cancer surgery and reconstruction of the radiated chest. The second part of the book is dedicated to aesthetic and corrective surgery (Chapters 16-28). 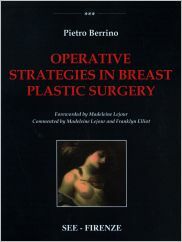 Chapters 16 to 19 describe the surgical procedures for breast re-shaping or reduction in ptotic breasts (Chapter 17), in medium hypertrophies (Chapter 18) and in severe hypertrophies (Chapter 19). The use of the techniques for contralateral reduction and re-shaping in post-mastectomy patients is described in Chapter 20, while errors are illustrated in Chapter 21. Chapters 22 to 26 are dedicated to breast augmentation: general concepts (Chapter 22), surgical procedures (Chapter 23), special problems (Chapter 24) and errors (Chapter 25). The final chapters describe the use of the illustrated techniques in the treatment of breast asymmetries (Chapter 27) and in the correction of Poland syndrome (Chapter 28). Prof. Pietro Berrino is internationally renown for his wide and innovative experience in breast aesthetic and reconstructive surgery. He has published more than 40 contributions on international Journals, and he is the Author of several book chapters. He has taken part as a faculty member in the most prestigious congresses and courses. He leads a course on breast aesthetic and reconstructive surgery which is held yearly in Genoa. Prof. Berrino is a Member of the Italian Society of Plastic Reconstructive and Aesthetic Surgery, Corresponding Member of the American Society of Plastic and Reconstructive Surgeons, and founding Member of the European Association of Plastic Surgeons. He hosted the 15th annual meeting of the European Association of Plastic Surgeons. Prof. Berrino has been in charge of the microsurgical Unit at the National Institute for Cancer Research of Genoa until April 2000. Since then he has been working as a private practitioner in the private Hospital Villa Azzurra, Rapallo, and in Casa di Cura Villa Montallegro, Genoa. His practice is mainly devoted to aesthetic and reconstructive surgery of the face and of the breast. He is a Consultant at the CSPO Oncological Center in Florence and teaching Professor at the University of Milan.